We’re pleased to announce that Korean popstar, Brian Joo will be joining New Heights as the guest artist for the band’s performance, ‘Summer of New Heights’ First Live in Kuala Lumpur this coming July at Bentley Music Auditorium,Mutiara Damansara. Brian Joo and New Heights met last summer while the former embarked on ‘Unveiled’ tour in the United States. They then collaborated for a track called“Nightmare” which was released via New Heights’ album, Something to Believe In. ‘Summer of New Heights’ First Live in Kuala Lumpur will be the first time ever for the close friends to perform together on the same stage. Due to popular demand, there will be an additional second show on July 15th2012 (Sunday). Meet & Greet Session will be on the same day at 4PM for Premium and Golden Access pass holders. 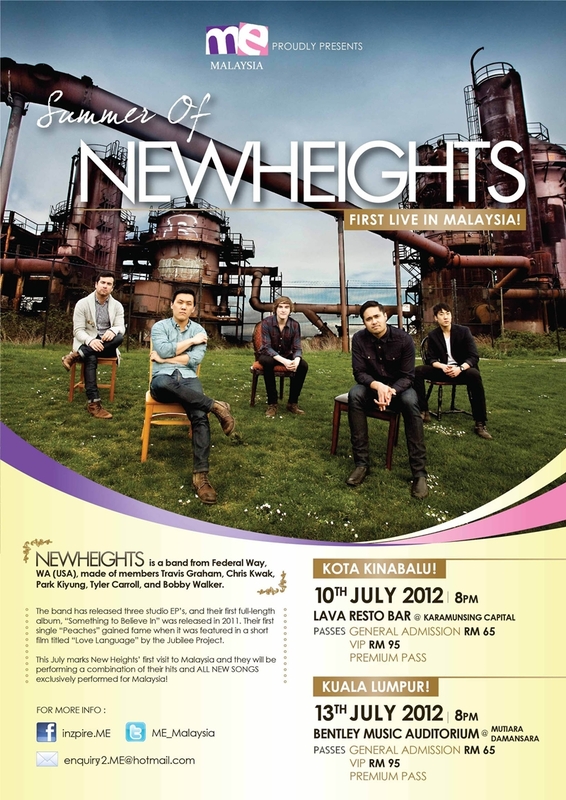 In line with M.E Malaysia’s continuous effort to bring more talented artistes to Malaysia’s shores, we are excited to have New Heights performing in Malaysia. This also marks New Heights’ first overseas appearances. Passes are available at Bentley Music Showroom in KL Plaza and Mutiara Damansara and also via online booking through enquiry2.me@hotmail.com. For more updated information, please log on to http://www.facebook.com/Inzpire.ME or twitter ME_Malaysia. New Heights is a band from Federal Way, WA (USA). The band, made of Asian-American members Travis Graham (lead vocal),Chris Kwak (guitarist), Park Kiyung (guitarist) and bassist Tyler Carroll, and drummerBobby Walker has released three studio EP’s and a full-length album, “Something to Believe In” to their credit. Their first single “Peaches” gained fame when it was featured in a short film titled “Love Language” by the Jubilee Project. 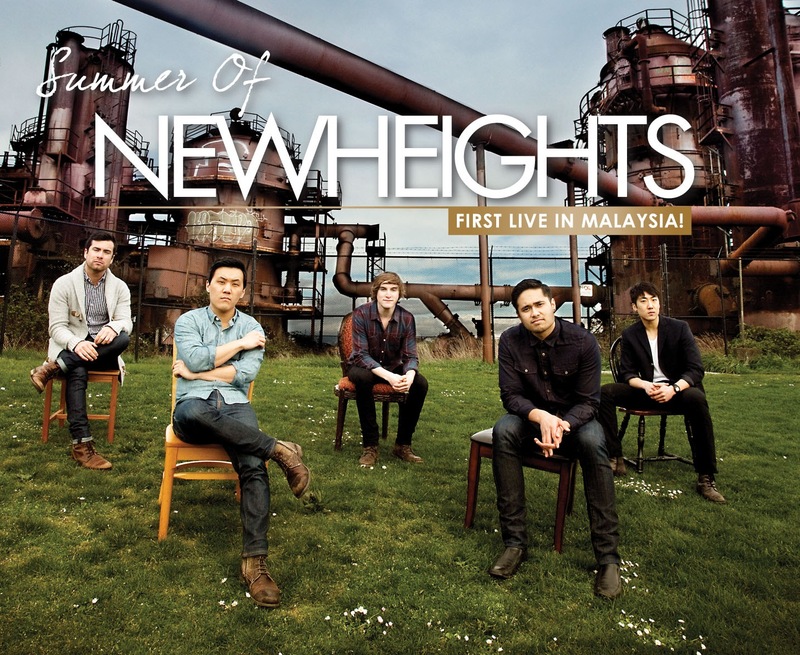 In 2011, New Heights were invited to be part of the highly popular International Secret Agents (ISA) concerts series that included names such as Far East Movement, Wong Fu Productions, Sean Kingston,Jay Park, David Choi, Ryan Higa, Clara Chung and many other YouTube stars. This opens up a whole new fan base and opportunities for the band which then goes on tour with Clara Chung, traveling all over the United States. New Height’s members Travis and Chris were also invited to meet the President of the United States as representative of the Asian American community last December 2011. Despite this success, the band remains humble, advising aspiring musicians to maintain their professionalism and to always strive for more.